The fight for survival in Raccoon City is exhausting enough. 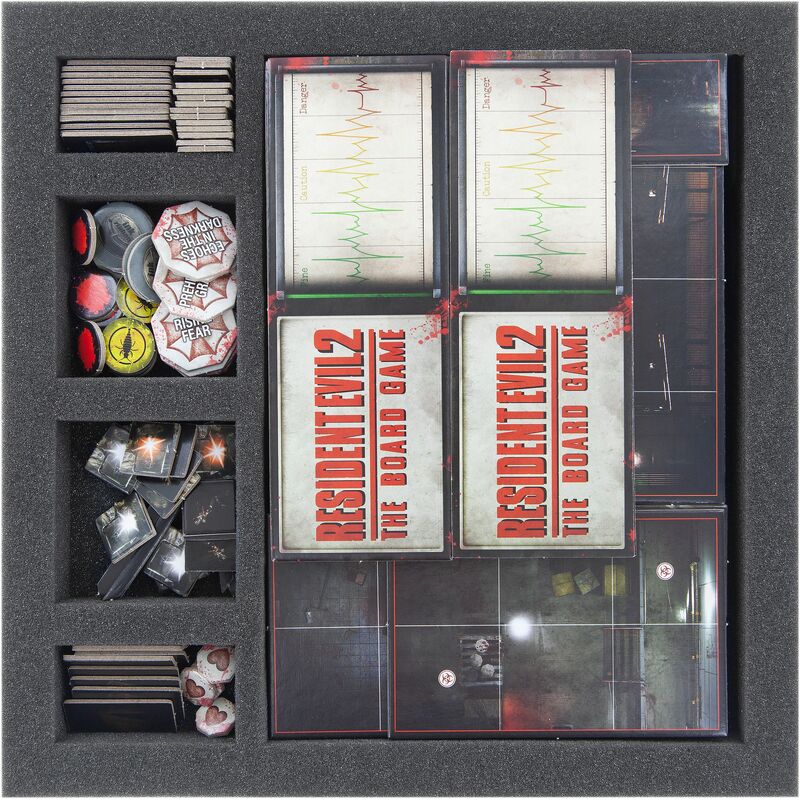 So you don't have to worry about the well-being of your miniatures and have more time to search for the sinister truth, we have the suitable foam set for your 'Resident Evil 2' board game box. 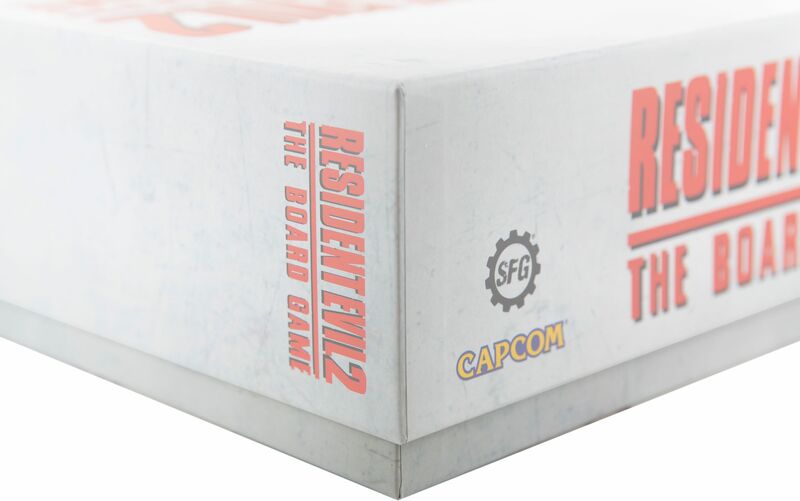 The set fits exactly into the original cardboard box of the 'Resident Evil 2: The Board Game' core game. 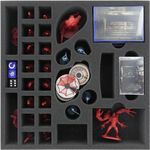 Provides space for all 24 miniatures and the complete game accessories of the core box. The lid of the board game box protrudes approx. 1 to 2 cm. 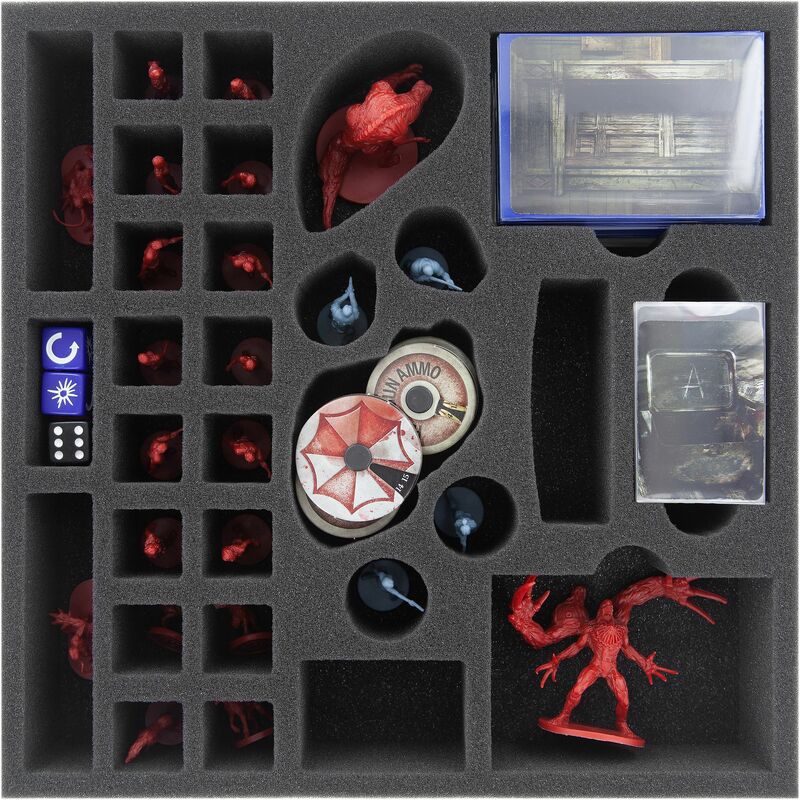 All of the game's miniatures find their place clearly arranged on the upper insert. 24 precisely fitting compartments ensure that the figures are optimally protected against damage. Ada Wong's gun is just as safe here as Birkin's claws. Each figure is completely surrounded by foam. Thus even the bumpiest transport cannot damage the sensitive parts. If you paint your miniatures, you can also be sure that the colors are protected from scratches and abrasion. 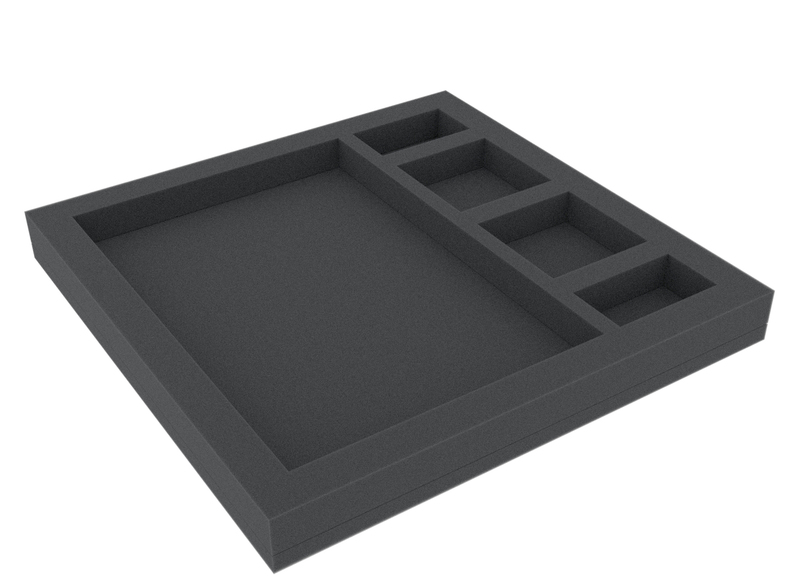 In addition, there is a compartment for the dice and one for the dials. To store the cards, there are 2 compartments with finger-wide recess for easy removal of the stacks. These of course fit here sleeved as well. 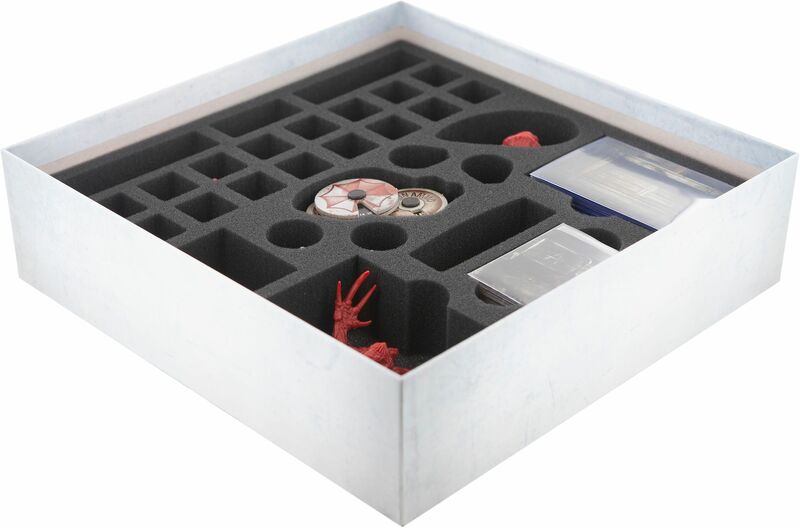 The lower foam tray with 5 compartments helps you to sort the tokens, markers and tiles. 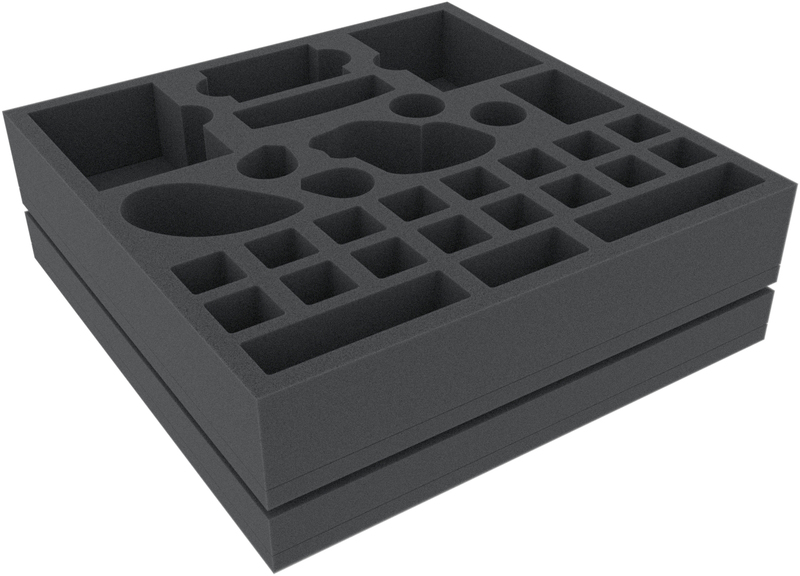 The large compartment holds the large tiles and health tracks. To sort the remaining cardboard parts you have 4 smaller compartments at your disposal. The set is completed with the matching foam topper. With this, the miniatures are completely surrounded by foam. On the topper there is still room for the rulebook and the scenario book. 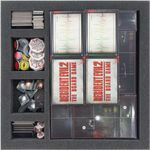 All miniatures are safely packed, the game material is clearly arranged and quickly available and you save time and nerves when setting up the game, which will be of much better use for the horrible adventures in Raccoon City.